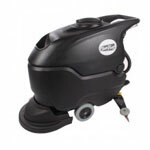 The EDIC Saturn 13" rotary floor machine is a great floor scrubbing buffer and carpet scrubber. Because of it's dual capacitors it can be used on either a hard surface, or a soft surface like carpeting. The 1.5 horsepower motor powers a machine that can scrub in the most friction filled environments. On thicker carpeting, it is harder for the machine to scrub, due to the greater friction of the brush versus the carpet. With the 1.5 HP motor, this carpet scrubber has no problem powering through the toughest situations. It can also be used to scrub hard floors, and is great for small areas like bathrooms and locker rooms. The all metal construction and dual planetary transmission guarantee good heavy-duty scrubbing, and longevity of the machine.